Have enough pumpkin spice in your life? 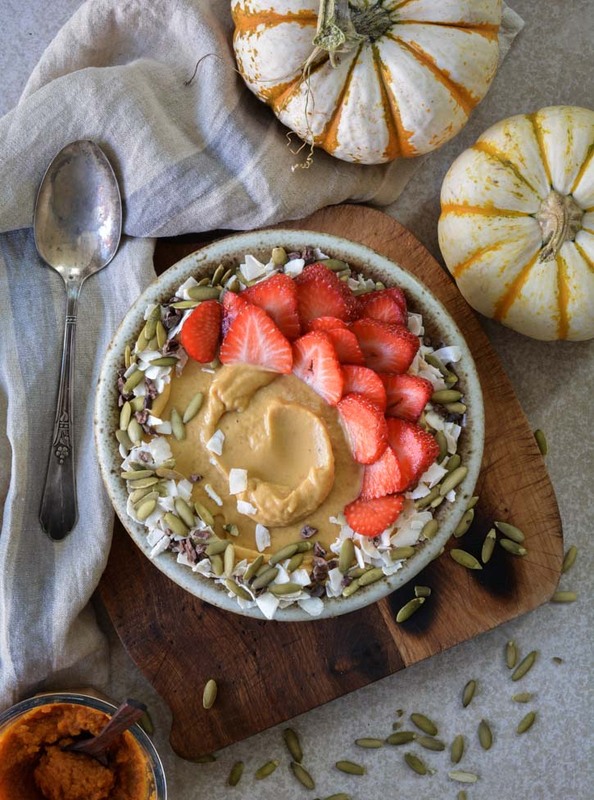 Pumpkin almond butter smoothie bowl adds that seasonal spice and is a delicious breakfast loaded with nutrients. As we approach this crazy season, it’s a good idea to restore our bodies with delicious healthy meals. Because most of us are burning the candle at both ends. Instead of drinking a breakfast smoothie on the go, pour a smoothie into a bowl and top with nutritious fruits, nuts, seeds, etc. Eating a smoothie bowl allows me to sit and slow down for a moment. Sitting while eating breakfast gives me time to organizing my day, reading email, or reading something uplifting and relaxing. low in Saturated Fat, and very low in Cholesterol and Sodium. It is also a good source of Vitamin E, Thiamin, Niacin, Vitamin B6, Folate, Iron, Magnesium and Phosphorus, and a very good source of Dietary Fiber, Vitamin A, Vitamin C, Riboflavin, Potassium, Copper and Manganese. The addition of almond butter adds protein and bananas provide loads of potassium. Topped with healthy fruits, raw nuts, coconut, and cacao nibs…always cacao nibs. Add smoothie ingredients into a blender in order given. Blend until smooth. Divide into 2 bowls. 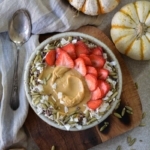 Top with slices strawberries, pumpkin seeds, coconut flakes and cacao nibs. Recipe makes 2 small smoothie bowls or 1 large. Nutrition facts do not include strawberries, coconut, pumpkin seeds, or cacao nibs. Any type of milk may be used.